01. January 23, 2019, Contravent, Salt Lake City, Ut. 02. January 24, 2019, Utah State University, Logan, Ut. 04. February 8-9, 2019, Portland Night Market, Portland, Ore.
05. February 13, 2019, Woodblock Chocolate, Portland, Ore.
06. February 18, 2019, Thread-X Conference, San Diego, Calif.
07. March 14, 2019, Capital One/VCU Brandcenter, Richmond, Virg. 08. March 15, 2019, Thrive Conference, Raleigh, No. Car. 09. March 21-22, 2019, Epicurrence Conference, Breckenridge, Colo.
10. April 3, 2019, AAF Jonesboro, Ark. 11. April 4-5, 2019, Creative Works Skill Camp, Memphis, Tenn.
12. April 9, 2019, WebaQuebec, Quebec City, Que. 13. April 12-13, 2019, Portland Night Market, Portland, Ore.
14. April 26-27, 2019, Art Show & Pop-Up, Mule Gallery, S.F., Calif.
17. May 22, 2019, TBA, Louisville, Kent. 18. May 23, 2019, Interactive Social 5, Lexington, Kent. 19. May 24, 2019, James Spears Lecture + Workshop, Knoxville, Tenn.
20. June 8, 2019, By Design Conference, Bratislava, Slovakia! Many more dates added to this tour soon! Stay tuned! We’re not listing the “tentative stuff.” Not until the deal is inked! We’ll come to yer town, too! Try us. 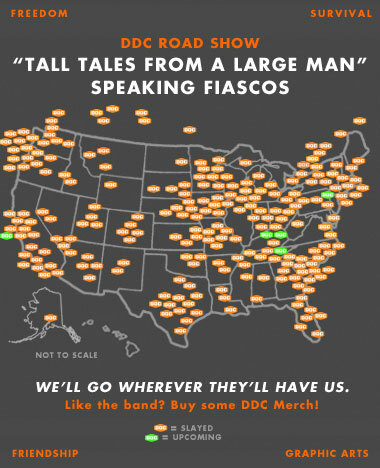 Our policy: “Go wherever they’ll have you!” Hit us up here, and bring the DDC traveling roadshow to yer city/school/halfway house/vo-tech center/farm. 01. Aug. 28, 2018, Rakuten, San Mateo, Calif.
02. Sept. 15, 2018, Print+Addiction!, Industry Print Shop, Austin, Tex. 03. Sept. 20, 2018, Advisors Excel Creative Retreat, Topeka, Kan.
04. Sept. 24, 2018, Denver Startup Week, Denver, Colo.
05. Oct. 1, 2018, UCDA Conference, Grand Rapids, Mich.
06. Oct. 3, 2018, Field Notes “End Papers” Launch Party, Coudal Partners, Chicago, Ill.
07. Oct. 5, 2018, Foundation Hotel, Talk & Workshop, Detroit, Mich.
08. Oct. 7, 2018, Phoenix Design Week, Phoenix, Ariz.
09. Oct. 10, 2018, RAMS documentary by Gary Hustwit, Guest speakers D’Wayne Edwards & Aaron Draplin, Portland, Ore.
10. Oct. 12-13, 2018, Portland Night Market, Portland, Ore.
11. Oct. 15-18, 2018, AdobeMAX, Los Angeles, Calif.
12. Oct. 25, 2018, Private Event, Portsmouth, N.H.
13. Oct. 26-27, 2018, Bay State Design Shop, Boston, Mass. 14. Oct. 30, 2018, Private Event, Boston, Mass. 15. Nov. 8, 2018, Blue Fish, Speaking Fiasco & Blistering Workshop, Mobile, Ala.
16. Nov. 16-18, 2018, DesignerCon, Anaheim, Calif.
17. Dec. 13-15, 2018, Portland Night Market, Portland, Ore.
01. June 20, 2018, Freshbooks #IMakeALiving event, Portland, Ore.
02. June 26, 2018, Smashing Conference, Toronto, Ont. 03. June 28, 2018, “Three Missions” Field Notes Launch Party, Coudal Partners, Chicago, Ill.
04. June 30, 2018, MLB Connect Conference, Chicago, Ill.
05. July 14, 2018, Popular Mechanics “The Lodge”, Portland, Ore.
06. Aug. 3, 2018, DDC merch table, TypeCon, Portland, Ore.
07. Aug. 16, 2018, Pop-Up Crop Portland, Portland, Ore.
01. Jan. 19, 2018, High Point University, High Point, NoCar. 02. Jan. 25, 2018, Churchill High School, Eugene, Ore.
03. Feb. 1, 2018, Hudl Headquarters, Lincoln, Neb. 04. Feb. 9 & 10, 2018, Portland Night Market, Portland, Ore.
05. Feb. 16, 2018, Beaverton High School, Beaverton, Ore.
06. Feb. 22, 2018, Clemson University, Clemson, SoCar. 07. Feb. 26 & 27, 2018 High Five Conference, Raleigh, NoCar. 08. Mar. 2, 2018, Portland Cartography Symposium, Portland, Ore.
09. Mar. 28, 2018, AAF Lubbock, Lubbock, Tex. 10. Apr. 6 & 7, Design Days, Carbondale, Ill.
11. Apr. 17, 2018, Smashing Conference, San Francisco, Calif.
12. Apr. 24, 2018, OSU Brand Symposium, OSU, Corvallis, Ore.
14. May 10, 2018, Awwwards Conference, San Francisco, Calif.
16. May 15, 2018, Dribbble Hangtime, Seattle, Wash.
19. May 29, 2018, DesignThinkers, Vancouver, B.C. 66. Sept. 29 & 30, 2017, Portland Night Market, Portland, Ore.
67. Oct. 7, 2017, DDC Pop-Up Shop at Outlet, Portland, Ore.
68. Oct. 11, 2017, DDC Pop-Up Shop at Burlesque, Minneapolis, Minn.
69. Oct. 12 & 13, 2017, AIGA Design Conference, Minneapolis, Minn.
70. Oct. 18-20, 2017, Lecture & Pop-Up, AdobeMAX, Las Vegas, Nev.
71. Oct. 26, 2017, AIGA Wichita, Wichita, Kan.
72. Oct. 27, 2017, Design Expo: “Design 66”, U of T, Arlington, Tex. 73. Nov. 2, 2017, AIGA Texas A&M, College Station, Tex. 74. Nov. 3, 2017, Crop Pop-Up, Austin, Tex. 75. Nov. 4 & 5, 2017, MondoCon, Austin, Tex. 76. Nov. 7, 2017, AIGA Oklahoma, Oklahoma City, Okla.
77. Nov. 8, 2017, Made in the Middle Mini at Plexpod, Kansas City, Mo. 78. Nov. 9, 2017, Mizzou, Columbia, Mo. 80. Nov. 11, 2017, DDC Pop-Up Shop/Field Notes HQ, Chicago, Ill.
82. Nov. 14, 2017, Workshop and Speaking Fiasco, Sioux Falls, SoDak. 83. Nov. 16, 2017, Speaking Fiasco, AIGA Nebraska, Omaha, Neb. 84. Nov. 17, 2017, Create 308, Grand Island, Neb. 85. Nov. 18, 2017, DDC Pop-Up Shop, Battery 621, Denver, Colo.
86. Nov. 19, 2017, Colorado State University, Fort Collins, Colo.
87. Nov. 20, 2017, Pikes Peak Comm. College, Colorado Springs, Colo.
88. Nov. 21, 2017, Welcome Fellow, Colorado Springs, Colo.
89. Dec. 3, 4 & 5, 2017, Portland Night Market, Portland, Ore.
89. Dec. 8, 9 & 10, 2017, Portland, Bazaar, Portland, Ore.
01. Jan. 20, 2017, AIGA Career Tools, Portland, Ore.
02. Jan. 20, 2017, Adobe Creative Jam, Portland, Ore.
03. Jan. 27, 2017, American Greetings Infusion Conf., Cleveland, Oh. 04. Feb. 4, 2017, WeMake “DDC Logo Workshop”, Portland, Ore.
05. Feb. 9, 2017, Clark College, Vancouver, Wash.
06. Feb. 15, 2017, University of Idaho, Moscow, Ida. 07. Feb. 20, 2017, George Fox University, Newberg, Ore. The spring tour starts…in an ORANGE VAN…. 08. Feb. 22, 2017, F.O.C. Creative Summit, Detroit, Mich.
09. Feb 23, 2017, Detroit Design Department/Vitamin T, Detroit, Mich.
10. Mar. 1, 2017, Oakland University, Rochester, Mich.
11. Mar. 2, 2017, DDC Book Talk, Mahall’s, Cleveland, Oh. 19. Mar. 13, 2017, Logo Workshop & Lecture, WNYBAC, Buffalo, N.Y.
20. Mar. 14, 2017, Stay Fresh Speaker Series, Syracuse, N.Y.
21. Mar. 16, 2017, MassArt, Boston, Mass. 24. Mar. 21, 2017, New Hampshire Inst. of Art, Manchester, N.H.
26. Mar. 24, 2017, UVM Snowboard Club, Burlington, Verm. 27. Mar 27, 2017, Workshop & Lecture, SUNY Adirondack, Q’bury, N.Y.
28. Mar. 28, 2017, Super Secret Variety Show, Brooklyn, N.Y.
31. Apr. 1, 2017, Steve DeCusatis Design/PhilaU, Philadelphia, Penn. 34. Apr. 5, 2017, Workshop & Lecture, AIGA Richmond, Virg. 35. Apr. 6, 2017, Workshop & Lecture, AIGA Hampton Roads, Virg. 36. Apr. 7, 2017, The Saturn, Birmingham, Ala.
37. Apr. 12, 2017, Pensacola State College, Pensacola, Flor. 38. Apr. 13, 2017, AIGA Gainesville, Gainesville, Flor. 39. Apr. 14, 2017, DDC Book Talk, Mama’s Sauce, Orlando, Flor. 40. Apr. 15, 2017, Mama’s Sauce Workshop, Orlando, Flor. 42. Apr. 19, 2017, Redpepper Workshop & Lecture, Nashville, Tenn.
43. Apr. 20, 2017, Marketing United, Nashville, Tenn.
44. Apr. 23, 2017, FITC Toronto, Toronto, Ont. 46. May 5, 2017, “Make A Logo The DDC Way”, Milwaukee, Wisc. 47. May 5, 2017, Draplin Does Milwaukee, AIGA Milwaukee, Wisc. 48. May 6, 2017, Field Notes/DDC Super Pop-Up Shop, Chicago, Ill.
49. May 7, 2017, Volume One/Font Diner Event, Eau Claire, Wisc. 50. May 10, 2017, Asymbol Gallery, Jackson Hole, Wyom. 51. May 11, 2017, Fact and Fiction Bookstore, Missoula, Mont. 52. May 16, 2017, Symantec Private Event, Portland, Ore.
53. May 25, 2017, FOGD PSU Show & Tell, Portland, Ore.
54. May 30, 2017, AIGA Orange County, Orange County, Calif.
55. May 31, 2017, Logo Workshop, Awwwards, Los Angeles, Calif.
56. June 1, 2017, Speaking Fiasco at Awwwards, Los Angeles, Calif.
57. June 8, 2017, Nevada Museum of Art, Reno, Nev.
58. June 14, 2017, VMA Design Conference, San Francisco, Calif.
59. June 15, 2017, Tuleburg, Stockton, Calif.
61. July 15, 2017, “The Lodge” by Popular Mechanics, Chicago, Ill.
62. July 29, 2017, Maker Faire, Henry Ford Museum, Dearborn, Mich.
63. July 30, 2017, Making Midwest, Columbus, Oh. 64. Aug. 1, 2017, Curiosity 360 Advertising, Cincinnati, Oh. 65. Aug. 24, 2017, Brilliant Books, Traverse City, Mich.
02. Sept. 9, 2016, Circles Conference, Dallas, Tex. 03. Sept. 10, 2016, Tiny Bus Collective Workshops, Dallas, Tex. 04. Sept. 15, 2016, AAF Central Minnesota, St. Cloud, Minn.
05. Sept. 17, 2016, Connecticut Art Directors Club, Hartford, Conn.
06. Sept. 22, 2016, Webvisions, Chicago, Ill.
07. Sept. 26, 2016, P&G World Design Meeting, Cincinnati, Oh. 08. Sept. 27, 2016, School of Advertising & Art, Dayton, Oh. 09. Oct. 5, 2016, BGSU GD/AIGA Toledo, Bowling Green, Oh. 10. Oct. 6, 2016, TEDx Detroit, Detroit, Mich.
11. Oct. 7, 2016, Ann Arbor District Library, Ann Arbor, Mich. 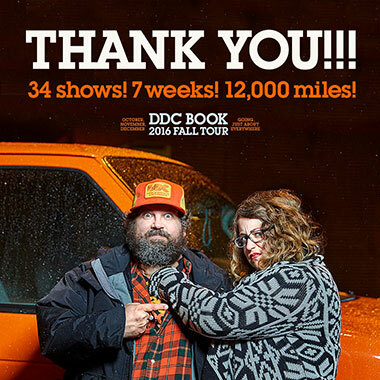 The “DDC Book Pretty Much Everything Tour” starts! In a van! 12. Oct. 10, 2016, Swivel Conference, Bend, Ore.
13. Oct. 11, 2016, AAF Spokane, Spokane, Wash.
14. Oct. 12, 2016, Wisetail Apex 4 LMS Conference, Bozeman, Mont. 15. Oct. 14, 2016, EO Entrepreneurs Organization, Denver, Colo.
16. Oct. 15, 2016, AIGA Colorado/DDC Pop-Up Shop, Denver, Colo.
17. Oct. 15, 2016, AIGA Colorado Springs, Colorado Spring, Colo.
18. Oct. 16, 2016, Welcome Fellow Workshop, Colorado Spring, Colo.
19. Oct. 19, 2016, Austin Init. for Graphic Awesomeness, Austin, Tex. 21. Oct 22-23, 2016, MondoCon, Austin, Tex. 22. Oct. 25, 2016, AIGA El Paso, El Paso, Tex. 23. Oct. 26, 2016, Creative Startups, Albuquerque, New Mex. 24. Oct. 27, 2016, P.S. Studios/Phoenix Design Week, Phoenix, Ariz.
25. Oct. 29, 2016, UNLV/AIGA Las Vegas, Las Vegas, Nev.
26. Nov. 1, 2016, LAdobe, Santa Monica, Calif.
27. Nov. 2-4, 2016, AdobeMAX, San Diego, Calif.
28. Nov. 5, 2016, UNIV Pop-Up Shop, Encinitas, Calif.
30. Nov. 10, 2016, Few, Little Rock, Ark. 31. Nov. 11, 2016, AAF Baton Rouge, Baton Rouge, Louis. 32. Nov. 14, 2016 Creative Works, Memphis, Tenn.
33. Nov. 15, 2016,AAF Montgomery, Montgomery, Ala.
34. Nov. 16, 2016, On Doers Episode 021, Switchyards, Atlanta, Geor. 35. Nov. 17, 2016, The Half and Half, Columbia, SoCar. 37. Nov. 19, 2016, TopCon!! !, Chattanooga, Tenn.
39. Nov. 28, 2016, Northern Michigan University, Marquette, Mich.
41. Dec. 2, 2016, Bloomington, Ind. 42. Dec. 3, 2016, DDC/Field Notes Super Pop-Up, Coudal Partners, Chicago, Ill.
01. Jan. 25, 2016, Florida Southern College, Lakeland, Flor. 02. Jan. 28, 2016, Switchyards Downtown Club, Atlanta, Geor. 03. Feb. 11, 2016, University of Kansas, Lawrence, Kan.
04. Feb. 12, 2016, AIGA Kansas City, Kansas City, Mo. 06. Mar. 4-6, 2016, DDC x MULE x SF Art Show/Pop-Up, SF, Calif.
07. Mar. 12, 2016, Analog by American Greetings, SXSW, Austin, Tex. 08. Mar. 24, 2016, Boston University, Boston, Mass. 09. Mar 31, 2016, Texas A&M Creative Summit, Corpus Christi, Tex. 10. April 5, 2016, Disney Imagineering, Orlando, Flor. 11. April 7-8, 2016, Creative South, Columbus, Geor. 12. April 15, 2016, Crop Conference, Baton Rouge, Lou. 16. May 2, 2016, Middle of the Map Fest, Kansas City, Mo. 17. May 6, 2016, Struktur Conference, Portland, Ore.
18. May 18, 2016, Webvisions, Portland, Ore.
19. June 4, 2016, Powells City of Books Book Signing, Portland, Ore.
20. June 7, 2016, 1000 Watt Agency, Portland, Ore.
21. June 16, 2016, Front End Design Conference, St. Petereburg, Flor. 01. Sept. 22, 2015, Camp Festival, Calgary, Alb. 03. Oct. 02, 2015, Made By Few, Little Rock, Ark. 04. Oct. 03-04, MondoCON, Austin, Tex. 05. Oct. 06, 2015, AdobeMAX, Los Angeles, Calif.
06. Oct. 08-10, 2015, AIGA Command-X, New Orleans, Louis. 07. Oct. 14, 2015, Salt Lake City Design Week, Salt Lake City, Ut. 08. Oct. 23, 2015, Collide FITC, Halifax, No. Scot. 09. Nov. 03, 2015, An Event Apart, San Francisco, Calif.
10. Nov. 06, 2015, GDC Man. & New Media Man., Winnipeg, Man. 11. Nov. 07, 2015, CanUX Conference, Ottawa, Ont. 12. Nov. 10, 2015, University of Iowa, Iowa City, Io. 13. Nov. 12, 2015, AAF Indianapolis, Indianapolis, Ind. 14. Dec. 2, 2015, Adidas Speaker Series, Portland, Ore.
15. Dec. 3, 2015, Hot Wheels/Mattel, El Segundo, Calif.
01. June 4, 2015, Future Insights Live, Las Vegas, Nev.
02. June 8, 2015, Starbucks Private Event, Seattle, Wash.
03. June 10, 2015, Stuck Private Event, Portland, Ore.
04. June 11, 2015, Facebook private event, Menlo Park, Calif.
05. June 12, 2015, Western Washington Univ., Bellingham, Wash.
06. June 15, 2015, GIANT Conference, Charleston, So. Car. 07. June 19, 2015, Dennos Museum, Traverse City, Mich.
11. Aug. 21, 2015, Hybrid Conference, Dublin, Ire. 01. Jan. 9, 2015, Cal Poly University Art Gallery, San Luis Obispo, Calif.
02. Feb. 12, 2015, Univ. of Akron Myers School, Akron, Oh. 03. Feb. 25+26, 2015, High Five Conference, Raleigh, N. Car. 04. Mar. 5, 2015, McMillan Advertising + Branding, Ottawa, Ont. 05. Mar. 12, 2015, Louisiana Tech, Ruston, Lou. 06. Mar. 19, 2015, Tulsa Art Directors Club, Tulsa, Okla.
07. Mar. 26, 2015, Springfield Creatives/Marlin, Springfield, Mo. 08. Apr. 2,“Bring Back Drap”, Boise, Ida. 09. Apr. 9, 2015, UMBC Artist Lecture Series, Baltimore, Md. 10. Apr. 16-19, 2015, Austin Design Ranch, Austin, Tex. 11. Apr. 23, 2015, Triangle ADFED, Raleigh, N. Car. 12. Apr. 28, 2015, Smashing Conference, Los Angeles, Calif.
13. Apr. 30, 2015, GROK, Greenville, S. Car. 14. May 5, 2015, Travel Portland Breakfast, Portland, Ore.
15. May 8, 2015, HOW Design Live, Chicago, Ill.
16. May, 21-23, 2015, TYPO Berlin, Berlin, Germ. 01. Sept. 11, 2014, Portland Art Museum, Portland, Ore.
02. Sept. 13, 2014, American Field, Boston, Mass. 03. Sept. 24, 2014, St. Louis Design Week, St. Louis, Mo. 04. Sept. 30, 2014, University of Minnesota Duluth, Duluth, Minn.
05. Oct. 2, 2014, AIGA Central PA, Lancaster, Penn. 07. Oct. 6, 2014, Adobe MAX, Los Angeles, Calif.
08. Oct. 9, 2014, TBA Portland Design Week Event, Portland, Ore.
09. Oct. 24, 2014, Design Week Birmingham, Birmingham, Ala.
10. Oct. 29, 2014, Michigan State University, East Lansing, Mich.
11. Oct. 30, 2014, Columbia College Chicago, Chicago, Ill.
12. Oct. 31, 2014, AIGA West Michigan, Grand Rapids, Mich.
13. Nov. 6, 2014, DesignThinkers Conference, Toronto, Ont. 14. Nov. 8, 2014, ConvergeFL Conference, Jacksonville, Flor. 15. Nov. 12, 2014, O’More College of Design, Franklin, Tenn.
16. Nov. 19, 2014, HOW Interactive Design Conference, SF, Calif.
01. Jan. 14, 2014, Symantec, Palo Alto, Calif.
02. Jan. 23, 2014, Facebook Design Lecture Series, Menlo Park, Calif.
03. Jan. 30, 2014, Mississippi State, Starkville, Miss. 04. Feb. 6, 2014, Univ. of Arizona School of Art, Tucson, Ariz.
05. Feb. 12-13, 2014, Tech Cocktail/Wedgies, Las Vegas, Nev.
06. Feb. 26, 2014, High Five Conference, Raleigh, N. Car. 07. Mar. 4-5, 2014, New World School of Arts, Miami, Flor. 08. Mar. 25, 2014, Columbus College of Art & Design, Columbus, Oh. 09. Mar. 27, 2014, AIGA Cleveland, Oh. 10. Apr. 2, 2014, FUZE Converence, Saskatoon, Sask. 11. Apr. 3, 2014, GDC Saskatoon, Sask. 12. Apr. 4, 2014, Hunt & Gather, Edmonton, Alb. 13. Apr. 11, 2014, TYPO SF, San Francisco, Calif.
14. Apr. 12, 2014, TEDx Portland, Portland, Ore.
16. Apr. 24, 2014, AIGA Wisconsin, Milwaukee, Wisc. 17. May 1, 2014, Converge, Columbia, S. Car. 18. May 12, 2014, HOW, Boston, Mass. 19. May 21, 2014, Columbia, S. Car. 20. May 22, 2014, Augusta, Geor. 22. 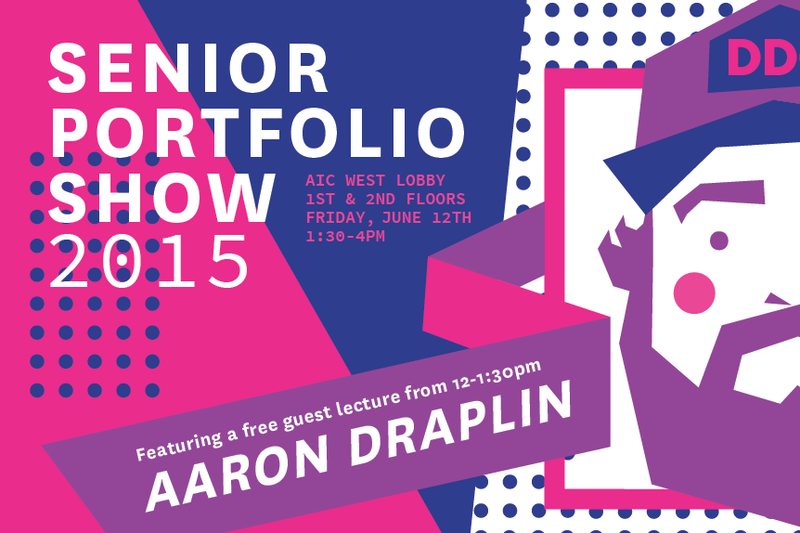 June 9, 2014, Friends of Graphic Design, PSU, Portland, Ore.
23. June 11, 2014, GIANT Conference, Charleston, S. Car. 02. Sept. 18, 2013, AAF Great Falls, Great Falls, Mont. 03. Sept. 18, 2013, Makerhaus - Make Good Society, Seattle, Wash.
04. Sept. 25, 2013, AIGA San Antonio, San Antonio, Tex. 05. Sept. 26-27, 2013, AIGA Houston: Design Week, Houston, Tex. 06. Sept. 28, 2013, AIGA Austin, Austin, Tex. 07. Oct. 3, 2013, School of Advertising Art, Kettering, Oh. 08. Oct. 4, 2013, AIGA Cincinnati: Cinci Design Week, Cincinnati, Oh. 09. Oct. 10, 2013, AAF Central Minnesota, St. Cloud, Minn.
10. Oct. 11, 2013, Pretty Much Everything Up To Oct.11, 2013 Gallery Show, Concourse Gallery, MCAD, Minneapolis, Minn.
11. Oct. 12, 2013, AIGA Head, Heart, Hand, Minneapolis, Minn.
12. Oct. 15, 2013, Go-For-Broke Party Down Sesh, Portland, Ore.
13. Oct. 17, 2013, Show and Tell, PSUGD, Portland, Ore.
15. Oct. 25, 2013, Web Design Day 2013, Pittsburgh, Penn. 16. Nov. 9, 2013, Top Conference, Chattanooga, Tenn.
17. Nov. 14, 2013, Fort Wayne, Ind. 18. Nov. 16, 2013, Seek Conference, Dekalb, Ill.
19. Nov. 21, 2013, Oklahoma City, Okla.
01. June 11, 2013, Hand-Eye Supply Curiosity Club, Portland, Ore.
02. July 12-13, 2013, Design Madison, Madison, Wisc. 01. Jan. 16, 2013, AIGA DC, Washington, D.C.
03. Jan. 24, 2013, Boise ADFED, Boise, Ida. 04. Feb. 15, 2013, SCAD, Savannah, Geor. 05. Feb. 18, 2013, Orlando AIGA InControl, Orlando, Flor. 06. Feb. 21, 2013, UTA, Arlington, Tex. 07. Feb 26, 2013, Bozeman, Mont. 08. Mar. 15, 2013, OTA Sessions, Sioux Falls, SoDak. 09. Mar. 19, 2013, AAF-ND, Fargo, NoDak. 10. Mar. 23, 2013, Screenland Brand Lab, Kansas City, Mo. 11. Apr. 5, 2013, AIGA Reno, Reno, Nev.
12. Apr. 10, 2013, New School of Architecture, San Diego, Calif.
13. Apr. 11, 2013, AIGA Los Angeles, Los Angeles, Calif.
14. Apr. 16, 2013, AAF-NB, Omaha, Neb. 15. Apr. 16, 2013, AIGA Nebraska, Omaha, Neb. 16. Apr. 18, 2013, SDAF, Sioux Falls, SoDak. 17. Apr. 20, 2013, FITC Toronto, Toronto, Ont. - A talk about things. 19. Apr. 26, 2013, Converge SE, Columbia, S.Car. 20. Apr. 27, 2013, Columbus Creative Design Conf., Columbus, Geor. 21. May 2, 2013, AIGA Maine, Portland, Me. 22. May 4, 2013, Made By Few, Little Rock, Ark. 23. May 6, 2013, Adobe Max, Los Angeles, Calif.
24. May 14, 2013, AIGA Knoxville, Knoxville, Tenn.
25. May 15, 2013, AAF Lexington, Lexington, Kent. 26. May 16, 2013, AIGA Charlotte, Charlotte, NoCar. 27. May 17, 2013, Mail Chimp, Atlanta, Geor. 28. May 23, 2013, AIGA Wichita, Wichita, Kan.
29. June 6, 2013, Interlink, Vancouver, Brit.Col. Still don’t believe us? Check out our “Gig Archives” section for proof!